King of the Outback is a jewel of an Australian children’s book with many facets to contemplate. It is also a picture book, a book of Australian history, a biography, obviously a non-fictional work but absolutely a delight to read. 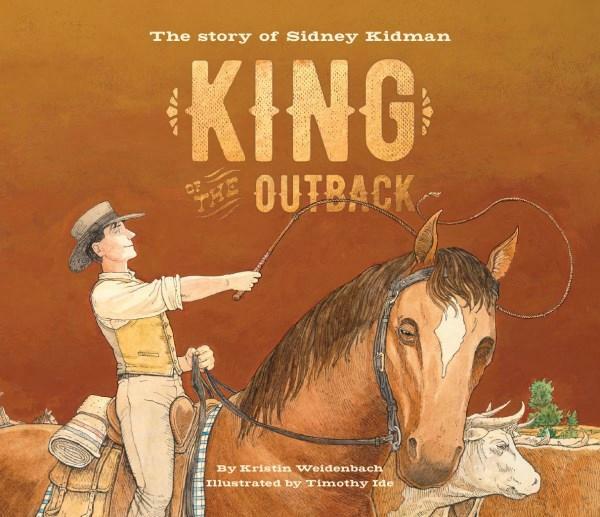 It is the life story of Sir Sidney Kidman who left home at thirteen with five shillings and a one-eyed horse, then ended up owning the largest cattle station in Australia. It is tempting to imagine how primary school children will approach this book. Some will look at the first few pages and then work through the book admiring the stylised pen and ink illustrations of people and animals surrounded by the colours of the bush. The watercolour palette is perfect. Other children will read the unravelling story on each page and immerse themselves into the story through the corresponding illustration. The expressions of the people and the brown landscape match the late nineteenth-century Australian country with its harsh dusty ground, the solid civic buildings and the fashionable clothing evident on the streets of the town. King of the Outback is also an ideal reader for parents and teachers to read to younger children whilst showing them the illustrations – I like looking at some of the people hidden in the crowds! You can almost hear the sounds emanating from the illustrations, enhanced by the use of an unusual selection of fonts and embellishments – font size, bold, curved, etc. I think that this arrangement of text is designed to keep the readers’ attention away from staring at the illustrations for too long instead of moving along with the story. The text is simple and effective. It gets the story told interspersed with many interesting facts and events like the impressive rescue of the town’s people from scared, rampaging cattle during Sid’s seventy fifth birthday rodeo. This book should make for excellent classroom discussions as this era of Australian history comes to life in thirty two pages. But don’t let any child walk out of the classroom with fifty cents and a ‘see you all later’.